Quite Simply the finest 4-point Mustang Racing bolt-in roll cage on the market. 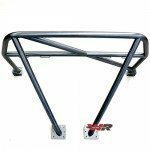 After extensive engineering, Watson Racing is proud to offer this top of the line, custom fabricated bolt in 4-point roll bar that is second to none! Quick-In and Quick-Out design. Perfect for part-time racers that don’t want a full-time roll bar. Uniquely-engineered Watson’s bolt-in roll cage mounting system stays hidden and mounted in the car. Unbolt the roll bar from INSIDE your car for quick removal and re-installation. Mustang bolt in roll cage serves multiple purposes, it protects the passengers in the event of a crash, provides a stronger Mustang chassis and enhances the unibody structure to get the most power available for your race car. 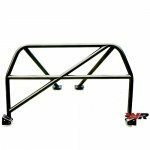 Watson Racing also offers Mustang Weld-In Roll Cages for Drag Racing & Road Racing. **Unfortunately, this part does not qualify for free shipping, Flat rate shipping cost in the continental U.S.
– Approximate Shipping Weight is 73 lbs.